What a difference a border makes! I've been in the pits, looking at this top, getting careless in my sewing, because I could not fathom all these scraps turning into anything useful. I had visions of stashing it in the car trunk for road-side emergencies and not ever looking at it again. 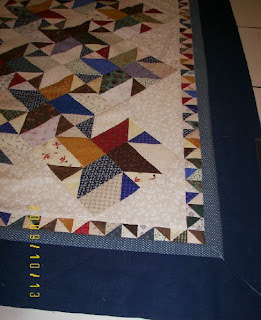 Another lesson to ME ... a decent border always gives an 'ordinary' quilt pizzazz! We are expecting warmer temps this weekend - the garage is full of clumps of mud, horse manure, slop, from our outdoor wedding adventure but I still want to baste this quilt Sunday. And below is my current Fabric Diet. I have been faithful in logging everything purchased that was sewing-related. Fabric IN is still gaining over fabric OUT, but at a slower rate than in 2008 (sounds like Federal budget conversation). I like it! That looks like Star Stuck, and I've been contemplating making one myself. That is a beautiful quilt and the border is icing on the cake! Are all those itty bitty half square triangles in the border made from the cutoffs after adding triangle corners in the blocks? The border is beautiful and really sets off the quilt; of course, I liked the center of the quilt before you added the border, too. Mercy, you're mitering the corners. What a brave soul you are! You have made the Star Struck your very own!!!!! Love the tiny border. Keep it in the trunk??? No way now! HA! We are to get a rain/snow mix today. YEA!!!!!!!! Beautiful! I love this border! Wow, Elaine, this is great. The HST border just 'makes' the quilt. Elaine, the border adds a certain va va va voom!! Congratulations on making this a show-stopper. Can you easily share how you worked out the math so that the triangles and HSTs for the border were the right size so they perfectly frame the center? Elaine, this is just lovely... and the border is perfect. Keep up the good work. Your comments actually encourage me because I'm quilting one that I don't like, but now I'm wondering if I should trust my own opinion! heeheh! It *is* a great border, but I have to disagree that it's an ordinary quilt -- I like it! The border definitely makes all the difference in the world. It's beautiful. Oh, gosh! That is a fantastic border! What inspiration! I've got to remember this. I'm copying your border picture and putting it in my QUILTS I LIKE folder! I cant wait to see a full pic of this lovely quilt, all finished! I will give your two cents!! Hee, Elaine, it is so wonderful, I am glad you added the border. I love it! Ooough la-LA! What an awesome quilt! that border is perfect for those star stuck blocks on point!!! That border is a testament to what borders can do--just beautiful--but the quilt was already lovely. I've been mulling over what kind of border to use for my latest quilt so this is good food for thought. I'd also be interested in how you calculated the size of HSTs you needed, if it isn't too much trouble to explain.